Use the form below to inquire about Riverside Stay Near Kuruvadweep . Use the form below to reserve for Riverside Stay Near Kuruvadweep . The Riverside Stay Near Kuruvadweep, also known as Kuruva Island, is the best tree house stay experience in this region. The verdant surroundings make for a relaxing and peaceful getaway. Trees, flowers, spice plantations, and paddy fields dot the landscape around the eight quaint cottages located on the property. This makes it easy for you to choose a spot to cuddle with a book or catch forty winks or click some great photographs. Each cottage has been named after a spice and designed in such a way as to bring in a bit of nature. The accommodation facilities also include three tree houses well-equipped with amenities. Some cottages are equipped with a kitchenette while another has trees passing through the bedroom and a third one has been made entirely of wood and bamboo. Another highlight of the resort is the treetop walkway that connects three of the cottages. Punarnava, the onsite Ayurveda Spa, offers guests the option of various treatment plans. A great way to combine a relaxing vacation with some rejuvenation for the soul and body alike. Choose from Panchakarma, weight or stress management, and skin or beauty care packages to name a few. 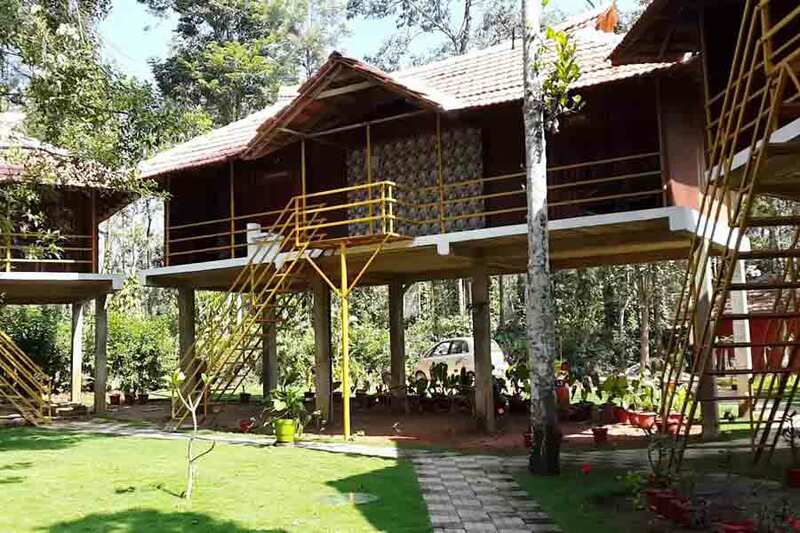 Being at this Riverside Stay near Kuruvadweep in Wayanad, you cannot afford to ignore the ancient heritage of the region which dates back 3,000 years. Evidence of the Stone Age civilization can be seen here even today. The region was also ruled by the Pazhassi Rajas, Tipu Sultan, and the British over the centuries. Today it is a part of the state of Kerala and is a separate district by itself. Kalpetta, Mananthavady, Sultan Battery, and Pulpally are just a few of the prominent towns in the district. Complimentary stay for children below 5 years. Rates are subject to change according to the season. All are family cottages suitable for couples. An extra adult will be charged at Rs 500/ night on CP Plan. Children 5 yrs and below stay complimentary. Check in at 12 noon and check out at 11 am. Full amount will be refunded after bank charges for cancellations done 14 days prior to check-in date. 50% of the amount will be refunded for cancellations done 7 days prior to check-in date. Trekking at Kuruva Island and in the nearby forest, as well as a safari Tholpetty Wildlife Sanctuary, are quite popular with guests. Sightseeing options in the vicinity are many such as Chembra Peak, Banasura Hydel Project, Ambalavayal Heritage Museum, Chetalayam Waterfalls, Pookot Lake, Kanthanpara Waterfalls, Begur Wildlife Sanctuary, Sentinel Rock Waterfalls, and Edakkal Caves. For travelers from Bangalore, there are a number of ways to get the Riverside Stay near Kuruvadweep. The route from Mysore to Nagarhole via Hunsur or from Mysore via Nanjangud and Gundlepet through Muthanga Wildlife Sanctuary are two options. But these roads might be closed from the evening to early morning and so you might want to consider alternate routes via Gonikoppa or Sulthan Bathery. If traveling from Calicut, take the route from Thamarasserry Ghat to Vythiri to Mananthavady to Kattikulam. The Kuttyadi, Niravilpuzha, Mananthavady, Kattikulam route is another option. Those heading for Riverside Stay near Kuruvadweep at Kabini from Coimbatore can commute from Ooty to Kurukkan Moola via Gudalur, Sulthan Bathery, Pulpally, Dasanakkara, Payampalli. The resort is at a distance of 7.5 km from Kurukkan Moola.